Your child’s Minnie Mouse party will be magical with the help of the 10 Cutest Minnie Mouse Cakes! Instead of whipping up a homemade Minnie Mouse cake, why not get some ideas for a Disney Minnie Mouse cake that will wow your guests and delight the birthday girl! 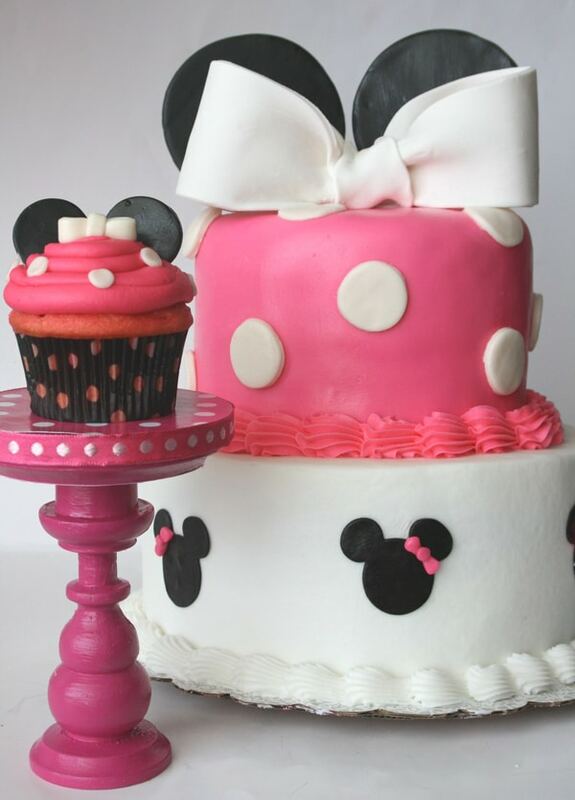 Are you planning a Minnie Mouse Birthday Party for your little one? Since the birthday cake is the centerpiece of the dessert table and everyone’s favorite party dessert, check out the 10 Cutest Minnie Mouse Cakes for a Disney Minnie Mouse party! 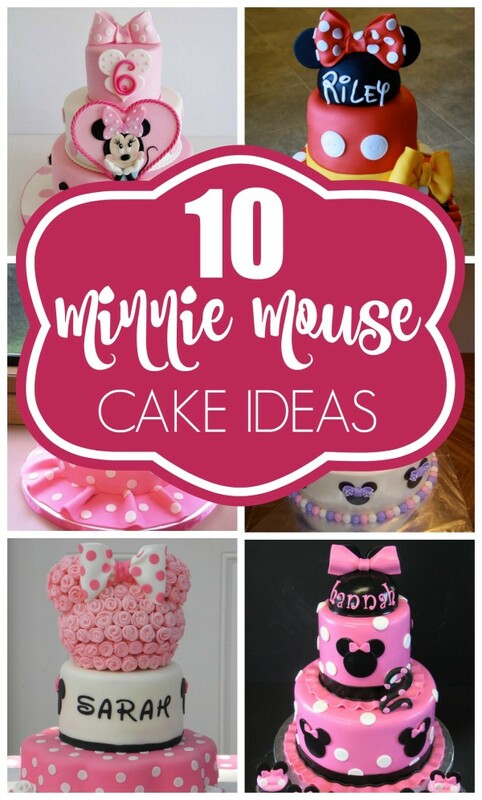 There are so many awesome Minnie Mouse cake designs, so if you don’t know how to make a Minnie Mouse cake of your own, you can use this inspiration to show to your local baker. Minnie Mouse is such a popular party theme, especially for a first birthday. I mean who doesn’t love Minnie Mouse, right?! There are tons of Minnie Mouse party ideas where you can find inspiration for decorations, food, party favors, desserts, cake toppers, and more! You can even find the cutest Minnie Mouse party outfit for your little one’s big celebration. If you’re in love with all things Disney, check out these Amazing Disney-Inspired Birthday Cakes. This perfectly designed Minnie Mouse Birthday Party Cake by Lenka Sweet Dreams is one of our absolute favorites for this Disney theme! Our favorite detail is the Minnie Mouse design in a pink heart in the center of the cake. The birthday girl’s name is underneath in Disney-inspired lettering – what a great touch! 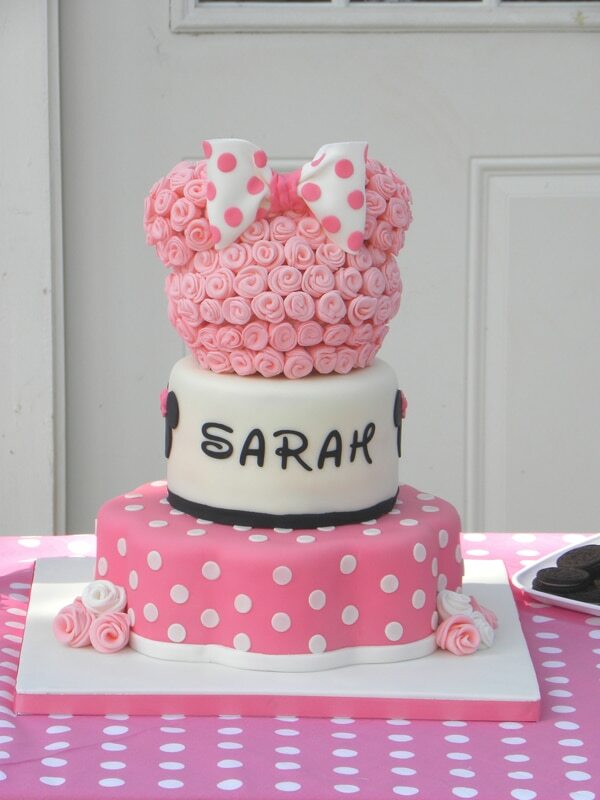 Minnie ears and pink bows fill the bottom layer and we can’t forget about some pink polka dots. The top layer of this three-tiered birthday cake design features the birthday girl’s age. The cake topper is simple a pretty pink and white polka dot bow. Next, this Disney Minnie Mouse Cake by Jillin25 features pink and white layers, followed by polka dot fondant on each layer. Pretty pink bows adorn the bottom of each layer, along with black and white polka dot ribbon. A big number 1 is front and center with the birthday girl’s name above it. The cake topper is a set of black Minnie ears with a white bow. What a pretty cake design for this theme. 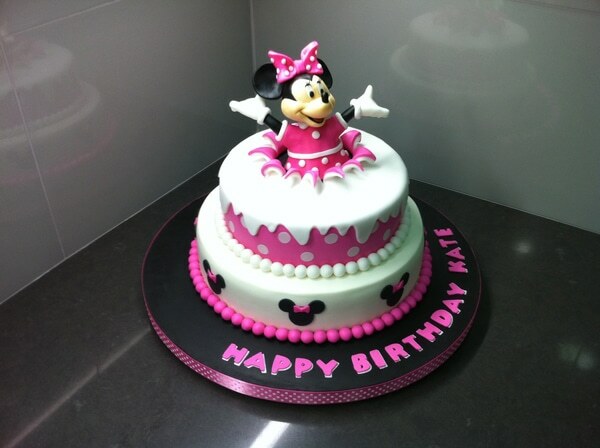 This sweet Minnie Mouse Cake from Kathy Co. is another one of our top favorite birthday cakes for this Disney theme. The top represents Minnie’s head and ears, but what’s so unique about it is that it features pink rosettes. The birthday girl’s name in Disney inspired lettering is front and center on the second cake layer, while the bottom of the cake features pink and white polka dots and small flowers. 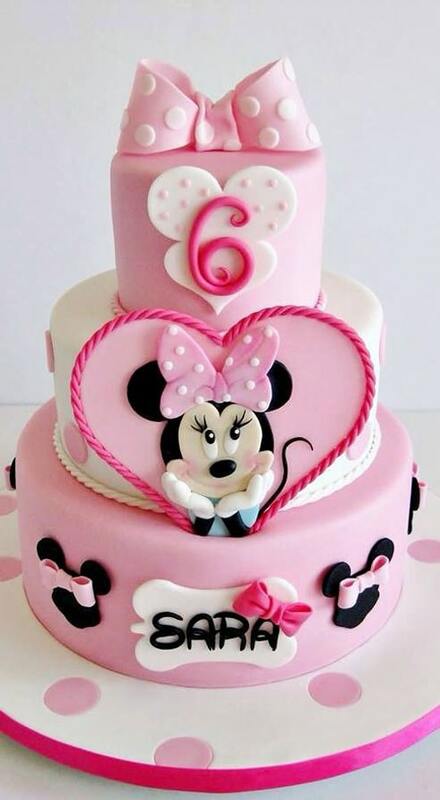 What a unique way to design a Minnie Mouse birthday cake. Are you loving the 10 Cutest Minnie Mouse Cakes yet?! A traditional red, white, black and yellow Minnie Mouse Birthday Cake designed by Flowers For Bella is certainly pretty with a yellow bow! Inspired by Minnie Mouse and her pretty dress, this cake is topped with Minnie Mouse ears. What a beautiful party cake. This pink, white and black polka dot Minnie Mouse Birthday Cake by Cathy230 also features cute cupcakes. 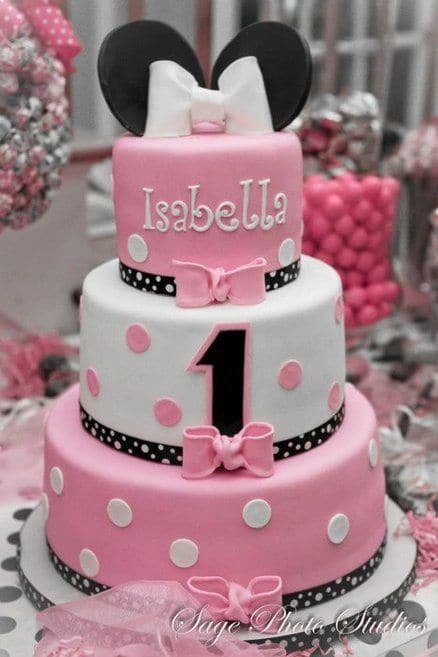 What a special and girly design for a second birthday. Pretty polka dots and bows seem to be the favorite details on these Minnie cakes, but we love this Minnie Mouse Themed Birthday Cake with a matching pink cupcake topped with Minnie ears from Love Me Some Cake. Don’t you just love how this Minnie Mouse design from Gina Falopez has a bottom layer made to look like a pink and white polka dot skirt?! The cake is topped with Minnie ears and the birthday girl’s name. What a cute birthday cake for a second birthday! We love the mix of pinks and purples in this Minnie Mouse Cake from Karolyn’s Kakes. 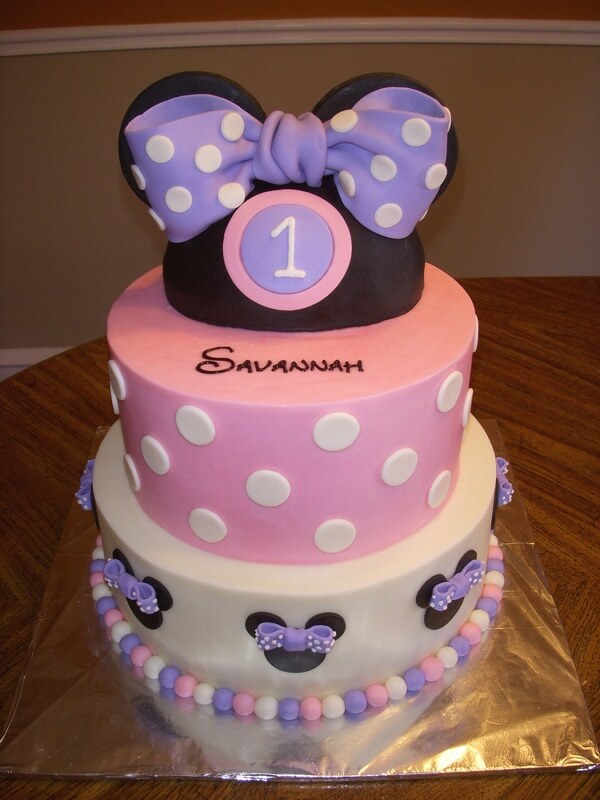 Polka dots, bows and Minnie Mouse ears make this adorable cake complete. We’ve seen a lot of Minnie Mouse themes done in the traditional black and red or pink and black, but adding purple into the mix is our favorite! Y’all know how much we love surprises and this Surprise Minnie Mouse Birthday Cake from Zeek71 is so creative and unique. It’s like Minnie just popped out of a present! 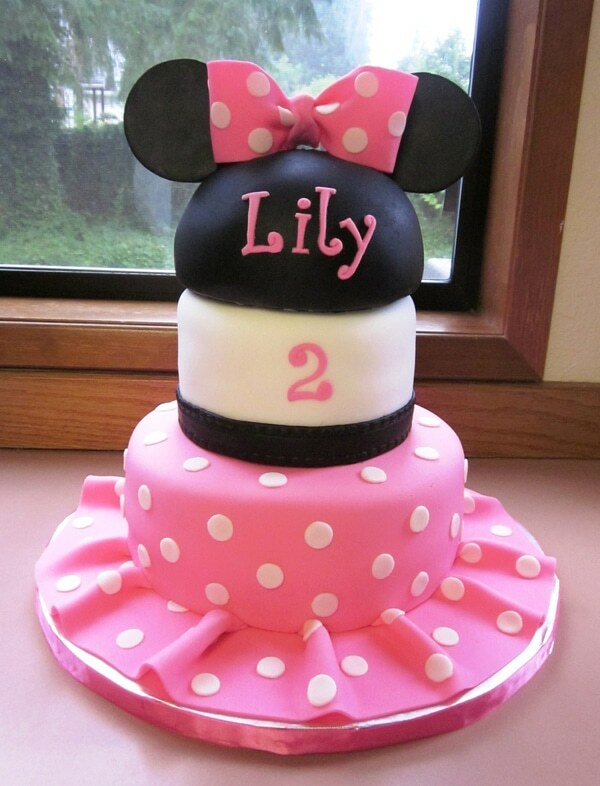 The pink, white and black two-layered birthday cake features black Minnie ears with pink bows. The top layer is pink with white polka dots. With Minnie as the cake topper, this birthday surprise is perfect for any Minnie Mouse fan! 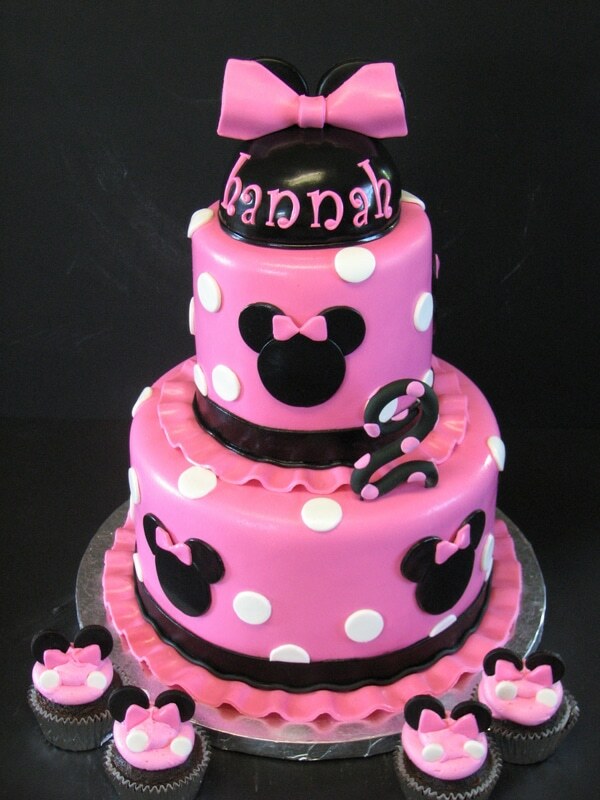 No matter which Minnie Mouse color palette you choose, the party and cake will be fabulous. 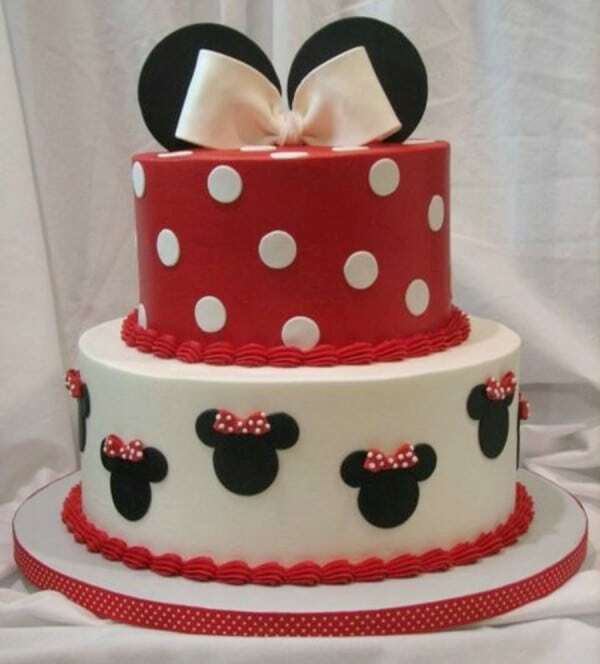 Any little girl will adore this Red, White and Black Minnie Mouse Birthday Cake from jaklotz1. This two-tiered cake features adorable fondant Minnie Mouse ears with a bow and Minnie ears as the cake topper! The top layer is red with white polka dots. 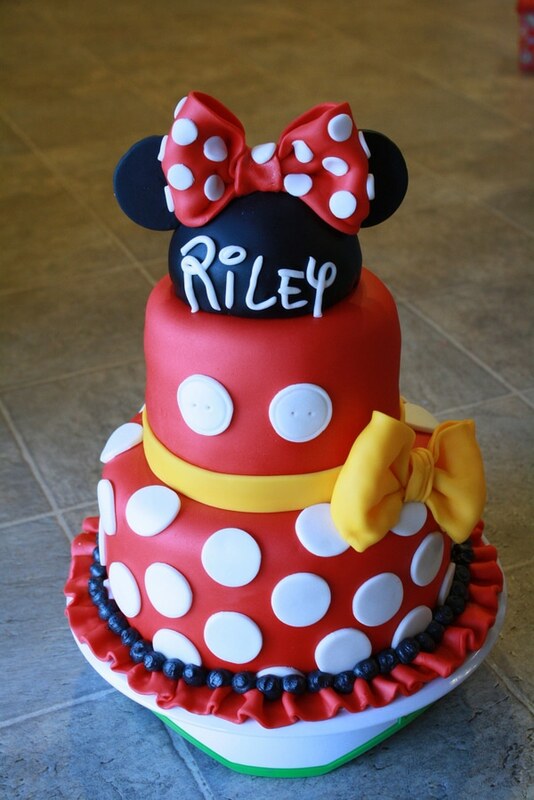 This cake is simple, yet totally adorable for a red, black and white Minnie Mouse Party. If you’re planning a Minnie Mouse themed party, don’t forget that the cake is one of the most important details of the whole party! Which of these 10 Cutest Minnie Mouse Cakes are your favorites? Let us know in the comments below. For more ideas, follow us on Instagram @prettymyparty and Pinterest and join us in our private Facebook group. They are very amazing cakes! This is my favorite disney character! I from İstanbul, thanks your publication.